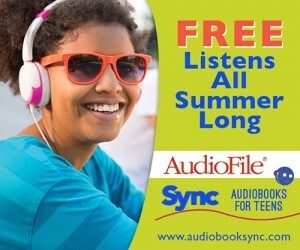 For the eighth year, SYNC is offering a free summer audiobook program for teens 13 and older. Young adults and educators will have the opportunity to download free audiobooks starting April 27. For the eighth year, SYNC is offering a free summer audiobook program for teens 13 and older. Two complete, thematically paired, audiobook downloads will be given away each week. Authors featured this year include Daniel José Older, W.E.B. Du Bois, Ruta Septys, Terry Pratchett, and Nikki Grimes. For more information, see the full press release below. The SYNC Audiobooks for Teens program, sponsored by AudioFile Magazine and powered by OverDrive, kicks off its eighth year on April 27th. Authors represented include, Franz Kafka, Ruta Septys, and Nikki Grimes. With parents, teachers, librarians, and teens looking for good media within easy access, SYNC is the perfect way to engage teens with new literature for their earbuds. SYNC makes available two FREE audiobook downloads every week, to each and every registered listener, all summer. In 2017, 32 titles will be given away through the 16 week-long season. Teens, librarians, club leaders, and educators may sign up for email or text alerts and can learn more at www.audiobooksync.com. SYNC creates weekly thematic pairings of teen-focused titles to encourage both critical listening and opportunities to make choices and develop personal tastes. During the summer of 2016, the SYNC program gave nearly 172,000 downloads to more than 31,000 participants. Any individual may participate by downloading the OverDrive App to their device of choice and returning to the SYNC website each Thursday after 7am Eastern Time to download the new audiobook pair for the week. Each title is available for one week only, but once downloaded they can be kept forever, so the opportunity to listen can extend well beyond the term of the summer program. SUMMER 2017 SYNC TITLE LINEUP April 27 – May 3 THE DEAD HOUSE by Dawn Kurtagich, Narrated by Charlotte Parry, Christian Coulson (Hachette Audio) THE PICTURE OF DORIAN GRAY by Oscar Wilde, Narrated by Greg Wise (Naxos AudioBooks) May 4 – May 10 FEED by M.T. Anderson, Narrated David Aaron Baker, John Beach, Anne Twomey, Tara Sands (Listening Library) THE HITCHHIKER'S GUIDE TO THE GALAXY by Douglas Adams, Narrated by Stephen Fry (Random House Audio) May 11 – May 17 BRONX MASQUERADE by Nikki Grimes , Narrated Jessica Almasy, Cherise Booth, Kevin R. Free, Marc Damon Johnson, Sisi Aisha Johnson, Melanie Martinez (Recorded Books) TEENAGE DIARIES: THEN AND NOW by Radio Diaries, Hosted by Joe Richman (HighBridge Audio) May 28 – May 24 THE GATHERING: SHADOW HOUSE BOOK 1 by Dan Poblocki, Narrated by Dan Bittner (Scholastic Audiobooks) IN OUR BACKYARD: HUMAN TRAFFICKING IN AMERICA AND WHAT WE CAN DO TO STOP IT by Nita Belles, Narrated by Nicol Zanzarella (Oasis Audio) May 25 – May 31 FREAKLING by Lana Krumwiede, Narrated by Nick Podehl (Brilliance Audio) BOY by Anna Ziegler, Performed by Sarah Drew, John Getz, Travis Johns, Amy Pietz, Bobby Steggert (L.A. Theatre Works) June 1 – June 7 BEAST by Donna Jo Napoli, Narrated by Robert Ramirez (Recorded Books) OF BEAST AND BEAUTY by Stacey Jay, Narrated by Julia Whelan (Tantor Media) June 8 – June 14 PLUS ONE by Elizabeth Fama, Narrated by Julia Whelan (Elizabeth Fama) IF I RUN by Terri Blackstock, Narrated by Nan Gurley (Zondervan) June 15 – June 21 THE RED UMBRELLA by Christina Diaz Gonzalez, Narrated by Kyla Garcia (Ideal Audiobooks) THE SOULS OF BLACK FOLK by W.E.B. Du Bois, Narrated by Rodney Gardiner (Dreamscape Media) June 22 – June 28 THE WITCH'S VACUUM CLEANER AND OTHER STORIES by Terry Pratchett, Narrated by Julian Rhind-Tutt (HarperAudio) THE WITCHES: SALEM, 1692 by Stacy Schiff, Narrated by Eliza Foss (Hachette Audio) June 29 – July 5 AMERICAN NIGHT: THE BALLAD OF JUAN JOSÉ by Richard Montoya, Developed by Culture Clash and Jo Bonney, Performed by Keith Jefferson, Richard Montoya, Todd Nakagawa, Sean San Jose, Kimberly Scott, Herbert Siguenza, Tom Virtue, Libby West, Caro Zeller (L.A. Theatre Works) MY NAME IS NOT EASY by Debby Dahl Edwardson, Narrated by Nick Podehl, Amy Rubinate (Brilliance Audio) July 6 – July 12 REBUTTAL by Jyotsna Hariharan, Narrated by Phoebe Strole, Michael Crouch, Nina Mehta (HarperAudio) REMEMBER TO FORGET by Ashley Royer, Narrated by Will Lasley (Blink) July 13 – July 19 THE DORITO EFFECT: THE SURPRISING NEW TRUTH ABOUT FOOD AND FLAVOR by Mark Schatzker, Narrated by Chris Patton (Dreamscape Media) SUGAR by Deirdre Riordan Hall, Narrated by Tara Sands (Brilliance Audio) July 20 – July 26 GONE: GONE SERIES, BOOK 1 by Michael Grant, Narrated by Kyle McCarley (Tantor Media) THE ONE SAFE PLACE by Tania Unsworth, Narrated by Mark Turetsky (HighBridge Audio) July 27 – August 2 AIRBORN by Kenneth Oppel, Narrated by David Kelly and a full cast (Full Cast Audio) SHADOWS ON THE MOON by Zoe Marriott, Narrated by Amy Rubinate (Brilliance Audio) August 3 – August 9 BETWEEN SHADES OF GRAY by Ruta Sepetys, Narrated by Emily Klein (Listening Library) IN MY HANDS: MEMORIES OF A HOLOCAUST RESCUER by Irene Gut Opdyke with Jennifer Armstrong, Narrated by Hope Davis (Listening Library) August 10 – August 16 SHADOWSHAPER by Daniel José Older, Narrated by Anika Noni Rose (Scholastic Audiobooks) METAMORPHOSIS by Franz Kafka, Narrated by Martin Jarvis (Naxos AudioBooks) About AudioFile Magazine AudioFile is the #1 source in the world for audiobook reviews with over 38,000 titles professional reviews already available. Nearly 400 new audiobooks are reviewed every 60 days. AudioFile features narrator and author profiles and awards exceptional performances with the coveted Earphones Award. www.AudioFileMagazine.com About OverDrive OverDrive is the leading digital distribution platform, supplying the industry’s largest catalog of eBooks, audiobooks, and streaming video to 34,000 libraries, schools and retailers worldwide. Founded in 1986, OverDrive is based in Cleveland, Ohio USA and is owned by Tokyo-based Rakuten. www.overdrive.com # # # If you would like more information, please contact SYNC Manager Michele Cobb at 401-354-9100 or michele@audiofilemagazine.com. You can follow AudiobookSYNC on Social Media: Twitter, Pinterest, Instagram and SYNCAudiobooks on Facebook. Does this work on kindles?